With tonight’s North West Derby have sold out earlier in the week, a capacity crowd will be in Maginn Park when the two teams take the field. In order to ensure all spectators enjoy the game, patrons are reminded of the following advice. The game is a complete sell out. No tickets will be available at the ground and no cash will be accepted at the turnstiles. If you are not in possession of a season ticket or match ticket, please do not make the trip. Home fans enter the ground via Ferris Lane. 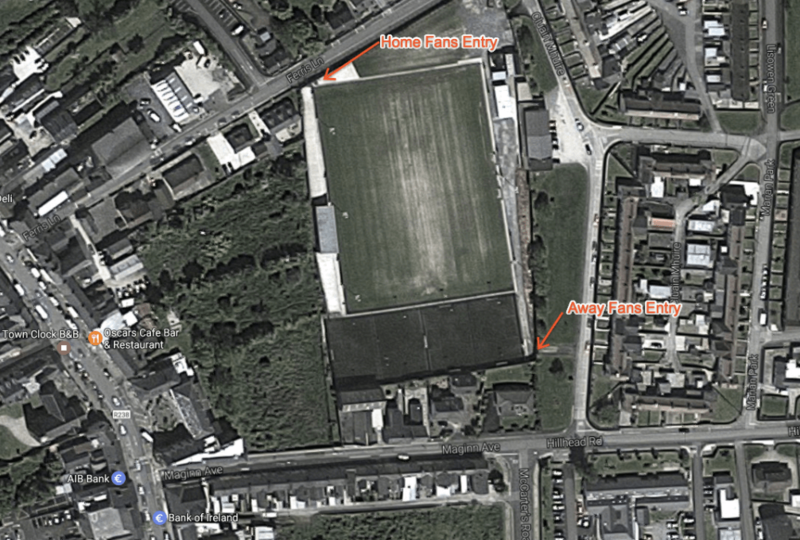 If you are parking on the Derry side of the pitch, you will be asked to use Maginn Ave and Main Street in order to join Ferris Lane. Please arrive in good time in order to gain access to the ground. As fans are aware, large queues have been forming prior to the gates opening for all games this season. Please respect the instructions of the stewards and gardai. Parking the Marian Park area is strictly residents only and will be accessed controlled. There are a large number of parking areas within a short walk of the ground and we would once again ask supporters to use these areas. Supporters holding tickets for the stand are reminded to arrive particularly early in order to facilitate the allocation of specific seats. Only those holding season tickets for the stand will be allowed to access this area. Supporters are asked to consider not to bring umbrellas to the ground. There is limited visibility at Maginn Park an the use of umbrellas can hinder and/or block the views of others around you. Whilst we understand that there may be inclement conditions, perhaps consider alternative measures to avoid the rain. Please, please don’t leave valuables visible in your car. It’s for your benefit we ask this. Please have respect for person’s private property. This is a residential area and we ask that all persons who attend have respect for person’s private property. The behaviour of all supporters was exemplary at the Bray Wanderers Match. No alcohol is allowed into the Grounds of Maginn Park. This shall be insisted upon by Derry City FC Stewards and enforced by Gardaí. Supporters are also advised that pubs in Buncrana are closed ALL DAY on Good Friday and that Buncrana also has an “Alcohol Free Zone” Policy in terms of drinking in public places which Garda will enforce. Pyro It is illegal to be in possession of fireworks, flares and smoke canisters etc without a license in the Republic of Ireland. Garda will adopt a ‘zero tolerance’ policy towards anyone found in possession of, or using such items within Maginn Park. No Excuses, No Exceptions. You have been warned. Parents please know where your children are. Again no issues in this regard at the last match, however we wish to drive this point home If young people are intending to arrive to cause annoyance or trouble for genuine supporters you will be dealt with by the Gardaí and/or the PSNI. If this is your intention don’t say you haven’t been warned, Gardaí or PSNI will be visiting your home and your parents may be visiting our station to pick you up!! !